For a broader coverage related to this topic, see Bathymetry. 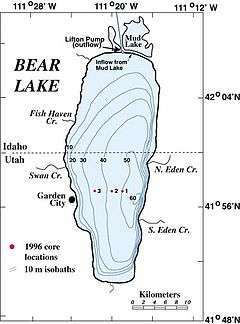 Bathymetric chart of Bear Lake. In an ideal case, the joining of a bathymetric chart and topographic map of the same scale and projection of the same geographic area would be seamless. The only difference would be that the values begin increasing after crossing the zero at the designated sea level datum. 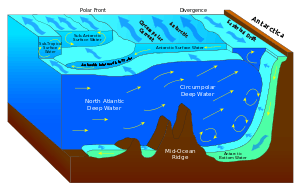 Thus the topographic map's mountains have the greatest values while the bathymetric chart's greatest depths have the greatest values. Simply put, the bathymetric chart is intended to show the land if overlying waters were removed in exactly the same manner as the topographic map. A bathymetric chart differs from a hydrographic chart in that accurate presentation of the underwater features is the goal while safe navigation is the requirement for the hydrographic chart. A hydrographic chart will obscure the actual features to present a simplified version to aid mariners in avoiding underwater hazards. Bathymetric surveys are a subset of the science of hydrography. They differ slightly from the surveys required to produce the product of hydrography in its more limited application and as conducted by the national and international agencies tasked with producing charts and publications for safe navigation. That chart product is more accurately termed a navigation or hydrographic chart with a strong bias toward the presentation of essential safety information. Bathymetric surveys and charts are more closely tied to the science of oceanography, particularly marine geology, and underwater engineering or other specialized purposes. Bathymetric charts can also be converted to bathymetric profiles. "The very earliest rendition of a bathymetric map of an oceanic basin. Matthew Fontaine Maury published this map in 1853 in his book "Explanations and Sailing Directions to Accompany the Wind and Current Charts ...." NOAA Photo Library.